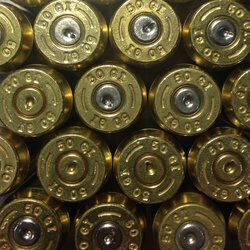 .50 GI *Polished* Range Brass - 25 count. Mixed Head-Stamps and are all yellow brass finish. Casings are Tumble Polished and ready to reload out of box. Brass typically ships either same or next day with an estimated arrival time of 2-3 days. ORDERED 1000 CASING OF .223, RECEIVED 1016 AND HAD 6 I COULDN'T PROCESS. GREAT PEOPLE TO BUY FROM. Received my 500 223 LC Brass today. Found 4 rejects and about 1.3 had dimples from too much lube when resized. Doesn't hurt anything. Will be fine after first firing. Have someone check the lube and this brass will be great. I was surprised I didn't have to ream the primer pockets.